Hello my dear readers! I hope all is well with you. I’m sorry that I haven’t been active on my blog for over a year. I have been shifting my time heavily towards my family, kids especially and their schools (from 0–>100% involvement), and thus I had to set aside my blog temporarily. To make up for my negligence is this toffee that I just tried for holiday treats. I am not into sweets typically but toffee with dark chocolate is an exception! My whole family actually love it. This recipe I found on the web is pretty easy to follow– they even have a quick video of making it. Here’s some tips for success~ Heavy saucepan, cook to temperature 315 degree, stir occasionally, medium heat. About the temperature, I tried it at 285 degree as suggested by the website, but found my toffee was not brittle enough with a bit of chewiness stick to my teeth. So I increased to 315 degree (by chance! ), and the nrittle texture is just right for me. Now toffee is definitely on my holiday treats and giveaway list. Merry Christmas to you and your family, and may your holiday season filled with love, warmth and peace! Put butter, sugar and salt in a heavy saucepan at medium heat. Stir in one direction until butter melts. Bring it to a boil. Cook until the mixture turns dark amber color, and candy thermometer reads 315°F. Stir occasionally. While the toffee is cooking, line a large baking pan (18 x 13 x 1 inch) with parchment paper. Leave some overhang parchment paper on both ends for easy lifting toffee later. Sprinkle 1 cup of chopped almonds on the parchment paper. When the toffee reaches 315°F, pour onto lined baking pan. Carefully spread to an even layer, covering all the chopped almonds on the pan. Sprinkle chocolate chips over toffee, wait 1-2 minutes for chocolate to melt. Spread chocolate into a thin layer with a spatula. Sprinkle chopped almonds over chocolate, press in gently with a spatula or hand. 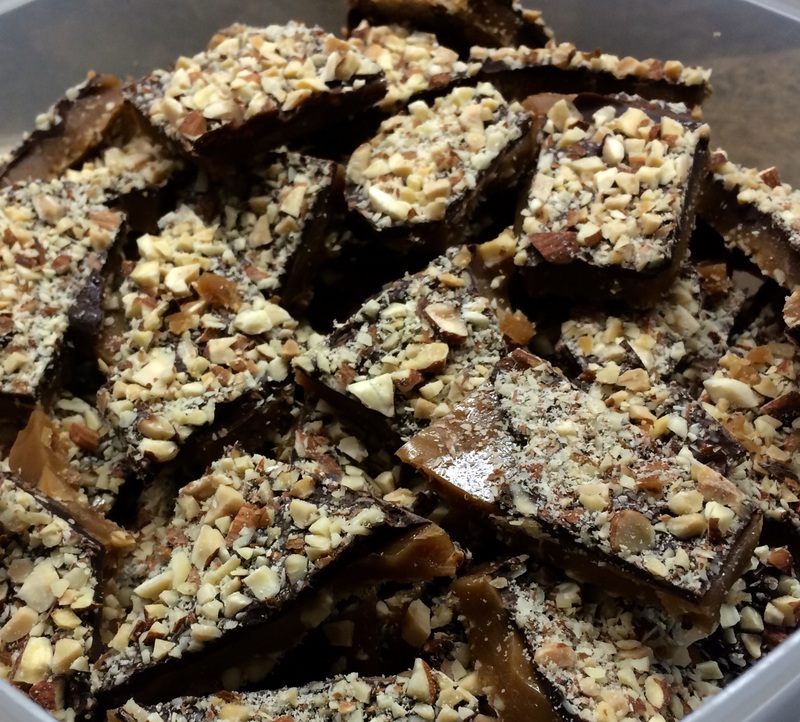 Chill toffee in the fridge until it is firmed. Break or cut into pieces. Store in air tight container.